To make the video fullscreen, begin playing a video and tap anywhere in the video window to bring up the control panel. From there, tap the two-arrow icon to make the video fullscreen. Repeat the process to bring the video back into the window. Note to iPhone users: You must initiate this process in portrait mode and then turn it into landscape mode if you want to watch the video in fullscreen landscape mode. To Airplay the video to an Apple TV or other Airplay-compatible streaming device, begin playing a video and tap anywhere in the video window to bring up the control panel. From there, tap the AirPlay icon to bring up a list of compatible devices within range of your iPhone or iPad and select the device you'd like to stream the video to. Repeat the process to return the video to the iPhone or iPad screen. 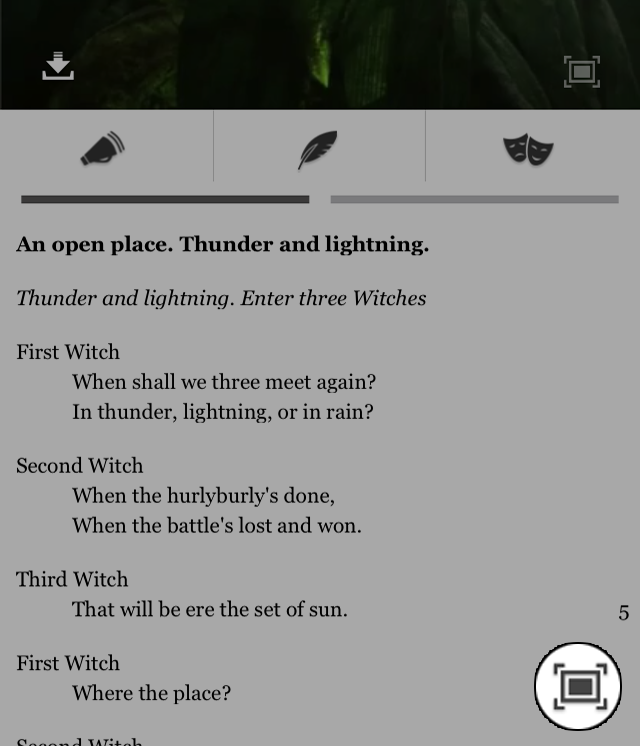 In the Shakespeare at Play app, you can access both the internal iOS dictionary as well as our custom glossary from any of the play texts. To look up any non-glossed words in the dictionary, simply hold your finger down over any word that appears in the text. The iPhone or iPad dictionary will then pop-up and give you a definition of that word. Any word that is in bold is part of Shakespeare at Play's custom glossary. Hold your finger down on any of those words or phrases and our custom definition will pop-up and give you a definition of that word or phrase. If you would like to eliminate the video window altogether, you can simply tap the text-expand icon at the bottom of the text window and the text will take up the entire screen. Tap it again to return to the two-window view. To access the in-line annotations on the iPhone, simply open any scene and rotate the iPhone into landscape view. The video window will disappear and the annotations will now run down the side of the screen. If a video is playing when the iPhone is rotated, the audio will continue to play so that the reader can follow along with the performance. To download a video from the scene itself, open the scene and click the video download button on the left-hand side of the video window. This will initiate the video download. You can also download scenes from the Download Manager, which is available from within any play's side menu (just click the three-line icon in the top-left of your screen). From the Download Manager screen you can initiate a download of any purchased plays on a scene-by-scene basis or all videos associated with that play by clicking Download All. From the Download Manager you can also delete any and all scenes that have been downloaded onto your device. © 2015 Rick Chisholm Productions Ltd.